Great selection of Motorcycle and scooter covers, fast shipping! Choose from our Elite Economy Heavy Duty Nylon, Elite Supreme 4 Layer Fleece Lined or Elite Deluxe 600Denier Polyester Motorcycle Covers. All Top of the Line. All Include Warrantees! Our economy cover size EM-1 fits most scooters up to 80" long. This cover is made from a metalized nylon material and has a tailpipe heat shield for maximum protection. The material is UV treated to help prevent fading. It is water repellent and has fully elasticized hems to help ensure a snug fit. There are also side grommets with a small bungee strap to help secure the cover down during hi winds. There is a bonus storage bag included. Incredible 1 Year Warranty. Approx. 2lbs. Demensions: 80"L x 44" W x 44"H. (at wheelbase) Suggested Retail Price $39.99. 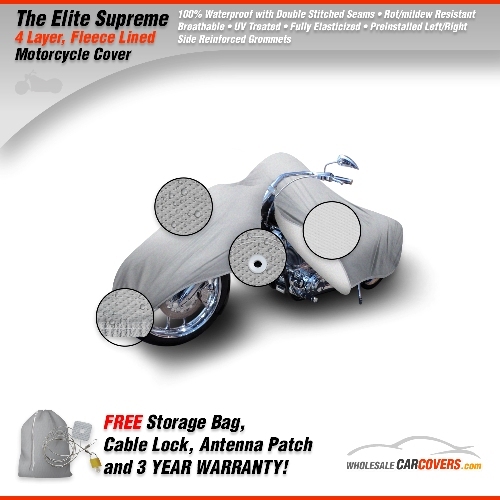 Our economy two tone cover size EM-2 fits sport bikes up to 80" long. This cover is made from a metalized nylon material and has a tailpipe heat shield for maximum protection. The material is UV treated to help prevent fading. It is water repellent and has fully elasticized hems to help ensure a snug fit. There are also side grommets with a small bungee strap to help secure the cover down during hi winds. There is a bonus storage bag included. Incredible 1 Year Warranty. Approx. 2lbs. Demensions: 80" to 90"L x 44" W x 44"H. (at wheelbase) Suggested Retail Price $39.99. Our two tone economy motorcycle cover size EM-3 fits bikes up to 1500 cc's. This cover is made from a metalized nylon material and has a tailpipe heat shield for maximum protection. The material is UV treated to help prevent fading. It is water repellent and has fully elasticized hems to help ensure a snug fit. There are also side grommets with a small bungee strap to help secure the cover down during hi winds. There is a bonus storage bag included. Incredible 1 Year Warranty. Approx. 2lbs. Demensions: Fits 90" to 99"L x 44" W x50"H (at wheelbase) Suggested Retail Price $39.99. Our two tone motorcycle cover size EM-4 fits bikes up to 2000 cc's or 100" to 110" long. This cover is made from a metalized nylon material and has a tailpipe heat shield for maximum protection. The material is UV treated to help prevent fading. It is water repellent and has fully elasticized hems to help ensure a snug fit. There are also side grommets with a small bungee strap to help secure the cover down during hi winds. There is a bonus storage bag included. Incredible 1 Year Warranty. Approx. 2lbs. Suggested Retail Price $39.99. EBK-SC2 - Deluxe Scooter Cover w/ Windshield fits up to 95"